As one might imagine in this increasingly digital age, old-school watchmakers are hard to come by. This was becoming a problem for technical director Terry Irby, who works for the watch company Tourneau, so he came up with a plan that not only equips his shop with more watchmakers, but also helps his surrounding community. 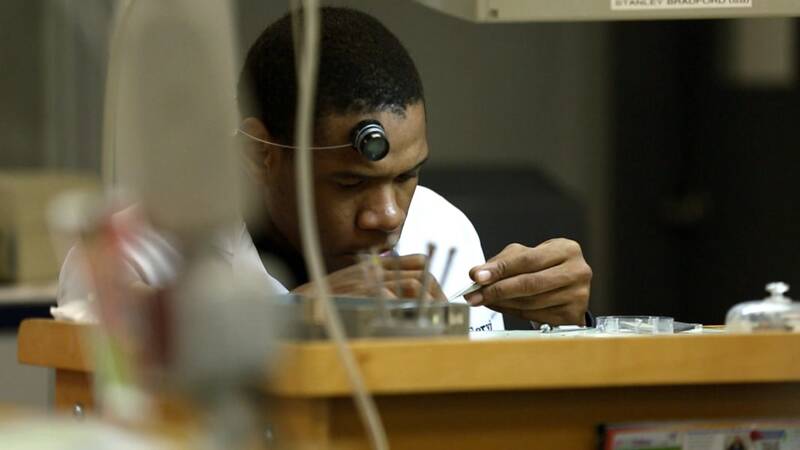 Irby founded a watchmaking program for at-risk high school students in Queens, New York, that allows them to explore an opportunity they would have never dreamed of. Edwin Larregui, a 19-year-old graduate of the program, says it would be fair to say that this experience saved his life. "It kept me away from a lot of things," he said. "I'm here and learning, I feel good." Most of the 19 students who have completed the program have similar things to say, and five of them are now full-time Tourneau interns. This means they get to set up shop with the “masters,” as Larregui puts it. According to Irby, it takes a special kind of person to handle the hundreds of tiny parts that make up each individual, unique watch. Irby says that a “high level of mental skills and a high aptitude” are necessary. One of the ways Irby determines if a student is up for the challenge is with a dexterity test. In this test, the individual’s hand-eye coordination is tested by shaping paper clips into the numbers one through five. Watch as Harry Smith takes a stab it.